until life got in the way. Katherine Hill left her small New England hometown in pursuit of a dream. Now, twelve years later, she’s a high-powered cosmetics executive in Manhattan and a much glossier version of her former self, unrecognizable to her family and old friends. Not that she would know—she hasn’t been home in over a decade. Laney Marten always swore she’d never get "stuck” in Manchester, Vermont. No, she was destined to live out her glamorous big-city dreams. Instead, she wound up a young wife and mother. That was when her best friend ran out. I love a great story about friends. I have lifelong friends who are testament to the fact that a true friendship can stand the test of time, distance and most importantly, circumstance. You Knew Me When introduced me to a friendship that was once as strong as those I enjoy in real life. The book opens with Devil Wears Prada-esque Katherine. I loved her sassy, in control character. Even though she was a bit of a bully, I was impressed with her no nonsense attitude and success as a cosmetics executive. I loved Laney too. She’s just like me. She’s stuck in a small town, a young mom and alone. I connected with Laney the most out of the two characters. I could really relate with Laney’s reluctant jealously that Katherine got to go on to the big city dreams that Laney once had and left her behind. I loved the storytelling style that alternated between the past and the present. The story always ends up seeming more dimensional to me. Emily Liebert did an amazing job writing about a true friendship. Katherine (Kitty) and Laney grew up with only one house in between them. That house belongs to Luella, who is a great literary character. I love her Victorian house, her clothes, her jewelry and her legacy. When the womens' lives take them both in opposite directions, they drift apart and circumstances that weren’t entirely clear at first stand between them, keeping them on nonspeaking terms for a decade. When Luella dies and leaves her Victorian house to the women, they are forced back together. Their journey back into each other’s lives and what they learn about both the people they were and the women they have become is a great story. 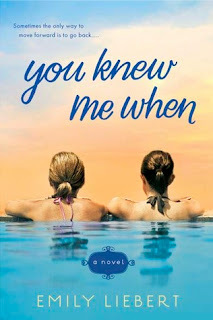 I loved digging into their past to find out who, what and why their friendship hadn’t survived their adulthood. I felt like I had gotten hold of some juicy diary entries from years passed. Though each character frustrated me at times because of the vague-ness of the story line and their past, I still enjoyed the book. I wanted it to move a bit faster than it did, which may have been because of the different time periods switching back and forth. If I had to sum of You Knew Me When into one word, I would say “endearing.” Endearing because friendships are truly more like a family when they are true and you can alway bet something as true as Laney and Kitty’s relationship will always have a happy ending.